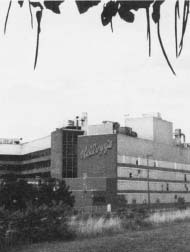 The Kellogg Company's South Plant, Battle Creek, Michigan. Reproduced by permission of AP/Wide World Photos. For millions of people around the world, breakfast includes a bowl of Kellogg's cereal. Starting with just one product, the Kellogg Company added many other items over the years, targeting sugar-coated cereal at children and offering bran and other healthy grains to adults. In recent years, the company has moved beyond cereal, selling snack bars and other foods that can be eaten on the run. Since its founding in 1906, the Kellogg Company has relied heavily on advertising to stir demand for its products. The company has also created several well-known cartoon mascots for its leading brands. Generations of children know Tony the Tiger, who roars about Kellogg's "Gr-r-reat" Frosted Flakes, and Toucan Sam, the colorful "spokesbird" for Froot Loops. Even as Kellogg's expands its offerings, cereal remains its most successful product, making the company the world's top cereal producer. The Kellogg Company was born in Battle Creek, Michigan, "the cereal capital of the world." Starting in 1876, Dr. John Harvey U. H.) Kellogg ran the Battle Creek Sanitarium, a health spa that promoted a vegetarian diet and forbid its guests from drinking alcohol or smoking cigarettes. Kellogg began experimenting with breakfast foods made from grain, to replace the typical late-nineteenth century breakfast centered around meat, eggs, and other heavy foods. One of Kellogg's first inventions was granola, which combined wheat, oatmeal, and corn meal. After trying granola at the sanitarium, many guests wanted to eat the cereal at home, so Kellogg established the Sanitas Food Company to make and sell the product. Dr. Kellogg had help running Sanitas from his younger brother Will Keith (W. K.). In 1894, the Kelloggs wanted to make a new wheat product that would be easy to digest. They tried putting boiled wheat through large rollers, hoping to make wheat flakes, but the process was a failure. After one batch of boiled wheat was accidentally left out to dry, the Kelloggs put it through the rollers, and this time the wheat formed small flakes. The brothers then baked the flakes, resulting in the first flaked cereal, which the Kelloggs called Granose. Subsidiaries: Argkel; CELNASA; Favorite Food Products; Garden City Bakery Ltd.; Gollek B.V.; K-One Inc.; KFSC, Inc.; Kelarg; Kelcone Ltd.; Kelmill Ltd.; Mountaintop Baking Company; Portable Foods Manufacturing Company Ltd.; Specialty Foods Investment Company; The Eggo Company; Worthington Foods, Inc.
Dr. Kellogg served his new cereal at the sanitarium, and Sanitas sold it by mail to former guests. By 1905, the company was also selling corn flakes, producing 150 cases a day. Sanitas had more than forty competitors by then, as other cereal companies sprang up in Battle Creek. W. K. Kellogg wanted to expand the business even more, but his brother disagreed. A biography of the younger Kellogg, The Original Has This Signature — W K. Kellogg, quotes his early thoughts on the business: "If given the opportunity, the food company would develop in such a manner that the sanitarium would be only a side show as to the food business." In 1906, W. K. Kellogg left his brother's sanitarium and founded the Battle Creek Toasted Corn Flake Company, selling a corn flake he had perfected at Sanitas. With his new company, Kellogg had the freedom he wanted to expand the business. He had already shown a genius for marketing, introducing the idea of offering cereal samples door-to-door. With his own company, Kellogg spent one-third of his money on a full-page ad in the Ladies Home Journal. Within a year, the Battle Creek Toasted Corn Flake Company sold more than 175,000 cases of its cereal. 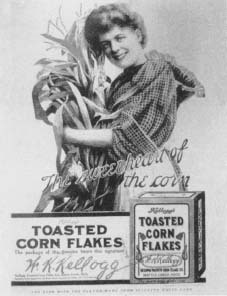 By 1909, annual sales of Toasted Corn Flakes reached one million cases. W. K. Kellogg starts the Battle Creek Toasted Corn Flake Company. Annual sales of Toasted Corn Flakes reach one million cases. Kellogg's opens a plant in Canada. Tony the Tiger is first used to promote Frosted Flakes. Kellogg's buys the Eggo Waffle Company. Kellogg's sells its first cereal bars. Carlos M. Gutierrez is named CEO of Kellogg's. Kellogg's completes its purchase of Keebler Foods. In 1907, Kellogg shortened his company's name to the Toasted Corn Flake Company (later he changed it to the Kellogg Company). The same year, the company's factory was destroyed by fire, but Kellogg quickly built a bigger and better plant. In 1910, Kellogg's gave consumers their first premium—a free gift inside the cereal box—called "The Funny Jungleland Moving Pictures Book." Two years later, the company introduced its second product, Krumbles, a shredded wheat cereal. Over the next several years, Kellogg's brought out two news cereals, 40% Bran Flakes and All-Bran. Except for a brief time after World War I (1914-18), the Kellogg Company continued to grow. By 1920, the company produced thirty thousand cases of cereal per day in Battle Creek. A Canadian factory had opened in 1914, and the company expanded overseas in 1923, opening a plant in Sydney, Australia. In 1929, stock prices crashed, leading to the Great Depression. At a time when many businesses cut advertising costs, Kellogg doubled its budget for ads and profits rose. Kellogg's began sponsoring radio shows for children and introduced cartoon elves called Snap, Crackle, and Pop to sell Rice Krispies, which hit the market in 1928. By the end of the decade, the company had ensured its place as the world's largest cereal company, selling 40 percent of all cereal purchased in the United States and holding more than half of the international market. By 1939, W. K. Kellogg had stepped down as head of his company, and Chicago banker Watson H. Vanderploeg became president. Kellogg had once hoped to turn control of Kellogg's to his son, John L., who had worked at the company during its early years. In 1925, however, a personal dispute between the two men led to John L. Kellogg's departure from the company. Kellogg then groomed his grandson, John Jr., as the next company head, but that plan did not work either. After a series of health problems, the younger Kellogg committed suicide in 1938. Vanderploeg, however, proved a fine successor, adding new products and taking them into new markets. Guests at the Battle Creek Sanitarium included such business leaders as Harvey Firestone (1868-1938) and Henry Ford (see Ford Motor Company entry) and the explorer Richard Byrd (1888-1957). Another guest, C. W. Post (1854-1914), ate Kellogg's cereal and then launched his own successful cereal company. In the 1950s, Kellogg's introduced its first sweetened cereals aimed at children. These products included Sugar Smacks and Sugar Frosted Flakes. To sell these new products, the company advertised heavily on television and introduced cartoon characters identified with each brand. The first, Tony the Tiger, appeared in 1952. The company also focused on the diet concerns of adults, launching Special K as a healthy, low-calorie cereal. Later in the decade, Kellogg's introduced a new slogan: "The Best to You Each Morning." One of the first Kellogg Cornflakes boxes, from 1906. Reproduced by permission of Archive Photos, Inc. In 1964, Kellogg's introduced a new breakfast product, Pop Tarts. Heated in a toaster, these fruit pastries provided a sweet alternative to cold cereal. The company also began adding new products by purchasing other companies. In 1969, it bought Salada Foods, best known for its tea; the next year Kellogg's bought Eggo Waffles, another breakfast food designed for the toaster. Kellogg's also took over Fearn International, a company that sold soups and other foods to restaurants, and several small foreign food companies. Some of this expansion came as Kellogg's faced problems with its core cereal business. 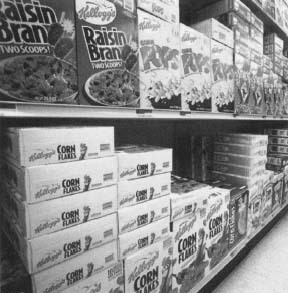 In 1972, the Federal Trade Commission (FTC) accused Kellogg's and its two major competitors, General Mills and General Foods, of keeping smaller companies out of the cereal market and of overcharging customers. The companies denied the charges and were not penalized. Cereal companies also faced criticism from dentists and other groups who blasted the high sugar content of cereals designed for children. In 1978, sales of Kellogg's sugar-coated cereals fell for the first time. Overall cereal sales were also slowing, as the number of young people in the United States decreased. This segment of the population was traditionally Kellogg's best market. In addition, the company faced competition from store-brand cereals, which cost less than name brands such as Kellogg's. During the early 1980s, Kellogg's tried to fight slumping sales in several ways. It returned to its Depression-era tactic of spending more on advertising. It also introduced new products. Some were targeted at children. Others, meant for adults, stressed good nutrition. In 1985, company chairman William LaMothe told Forbes, "[Health] is our thing.… Where else can you get such nutrition for twenty cents a serving?" By 1988, Kellogg's increased its annual sales more than 50 percent, going from $2.4 billion (in 1983) to $3.8 billion. The company also had success with a new type of product, cereal and snack bars. It launched Smart Start Cereal Bars in 1989, then changed the name to Nutri-Grain in 1991. Other bars followed, and Kellogg's eventually became the leading seller of cereal and snack bars. These products were a response to changing eating habits. Fewer Americans were eating breakfast sitting at a table; they wanted food they could eat on their way to school or work. Snack bars promised quick energy boosts or a tasty treat any time during the day. To j. H. and W. K. Kellogg, their cereals were health food. Starting in the 1930s, Kellogg's was the first company to put nutritional information on its packages. Later, during the 1980s, it introduced a number of cereals made from whole grains. While grains are healthier than grain that is heavily processed before it is cooked. In recent years, however, Kellogg's and other large food companies have been questioned about using genetically modified foods. Scientists can change a crop's genes, the basic chemicals that control how all plants and animals develop and function. Genetically modified plants might grow faster, taste better, or resist insects. Some environmental groups believe these modified foods may be dangerous to humans. The organization Greenpeace has criticized Kellogg's for using genetically modified corn and soybeans in some of its products. In 2001, Kellogg's recalled corn dogs sold under its Morningstar Farms brand, after tests showed it contained traces of modified corn not approved for use in foods. During the early 1900s, Kellogg's sold some of the food companies it had bought earlier to focus on cereal and other breakfast foods. Competition was again tough, as consumers bought even more store-brand products, and major rival General Mills lowered its prices, forcing Kellogg's to follow suit. Overseas, a new partnership between General Mills and Nestle was stealing some of Kellogg's customers. Most grocery store displays illustrate how Kellogg dominates the cereal market. Once again, Kellogg's fought back with more advertising and new products. In 1997, it opened the W. K. Kellogg Institute for Food and Nutrition Research, where food experts tried to create new items. In 1999, a Kellogg's researcher told Fortune the company wanted "to make foods that are tastier, healthier, and easier." The Kellogg Institute's efforts included Rice Krispies Treats, snack bars based on the popular cereal, and an improved Raisin Bran that did not get soggy in milk. Despite its innovations, Kellogg's saw its cereal sales remain basically flat after 1994. In 2001, the company tried to bolster sales by announcing a deal with the Walt Disney Company (see entry). Kellogg's began selling cereal featuring several popular Disney characters on the boxes, including Winnie the Pooh and Mickey Mouse. Kellogg's also took a major step into a new market when it bought Keebler, the second-largest cookie-and-cracker manufacturer in the United States. After adding Keebler's products, Kellogg's made 60 percent of its sales from cereal, compared to 75 percent before the deal. The year before the Keebler purchase, Kellogg ventured into another new area, buying Worthington Foods, the manufacturer of vegetarian "meat" products. A company founded on corn flakes has moved far beyond breakfast, while remaining a major international food corporation. Blankm, Arthur Kellogg, W. K.